Well, it appears that the upside to being made unemployed / redundant, is that I now have a lot of free time on my hands to knit. Specifically to knit socks and try and make my way through the mountain of sock yarn in my stash before it collapses on me. So, in the interests of not being buried alive under a pile of yarn, I've finished off these little pretties. 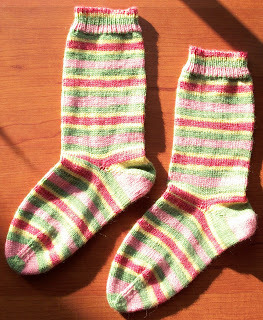 The first is a pair of socks that I knitted for my mother for Mother's Day. In a change of routine with me and deadline orientated gift knitting, I actually finished these with time to spare (as opposed to my usual routine of staying up till midnight knitting my fingers to the bone, trying to get the present completed). 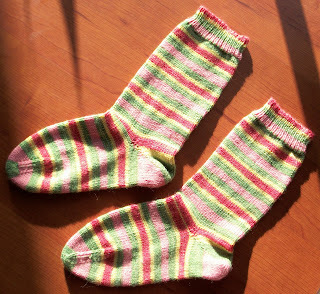 Nice and bright, these socks were well received, and I was left with a clear conscience to knit on something for me. Orange is not normally a colour I like to knit with (think the ugly burnt orange of 70's appliances if you want to know why), but I saw the design process on the Knitspot blog, and I had to knit it. Then, because my dad has finally stopped picking on me about the fact that I knit, long enough to actually request something, I had to start these.